Both sides of the road, east of the junction of Ling Lane with Newbridge Lane. 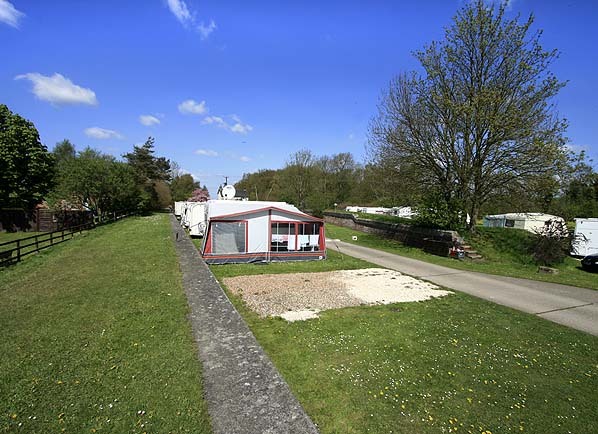 The site of the up platform and goods yard is now occupied by the Fangfoss Caravan Park. 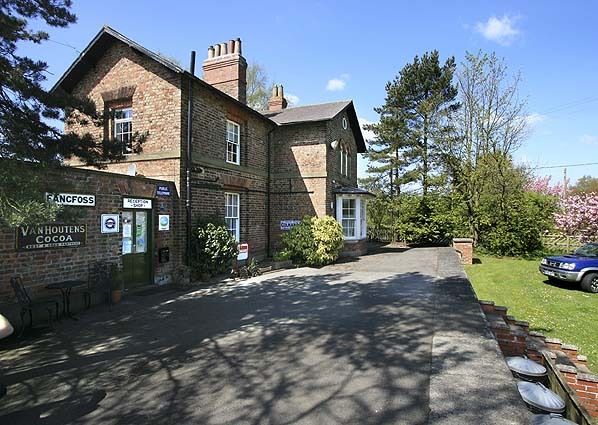 The owner lives in the station house, with an office and shop also in the station building. A number of enamel signs have been mounted on the wall, including an old Fangfoss station sign, although it is unclear if this is original. The platform remains in good condition It has been resurfaced in front of the station building and, for most of its length, is grass covered. Concrete has been laid along the platform edge covering the original edge stones. Opposite the platform the two-level stepped loading dock is extant together with some sections of brick wall from the coal drops. 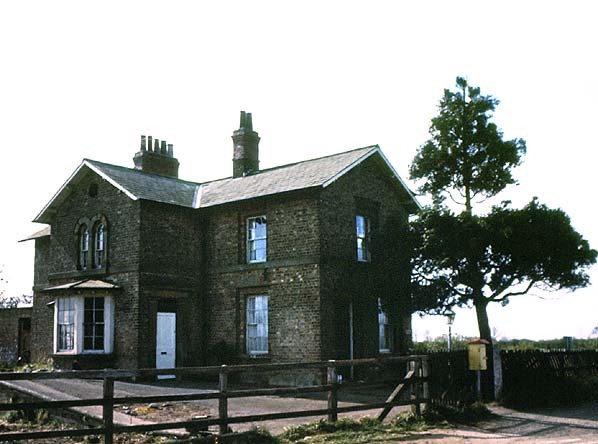 Notes: Although the York - Market Weighton line opened on 4th October 1847 it is unclear when Fangfoss station opened. It might have been on the same date as the line, although it did not appear in public timetables until May 1848. 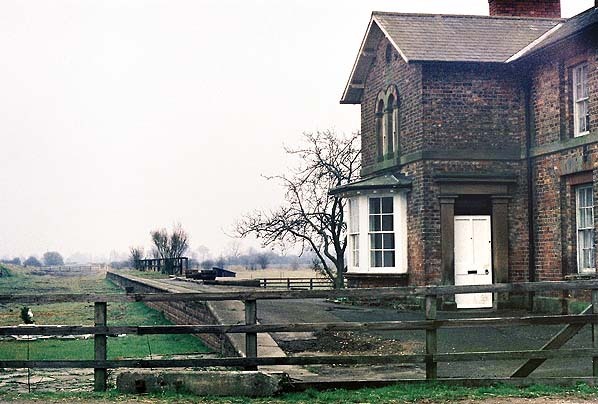 Fangfoss had staggered platforms: the down platform was on the north side of the level crossing while the up platform was on the south side. 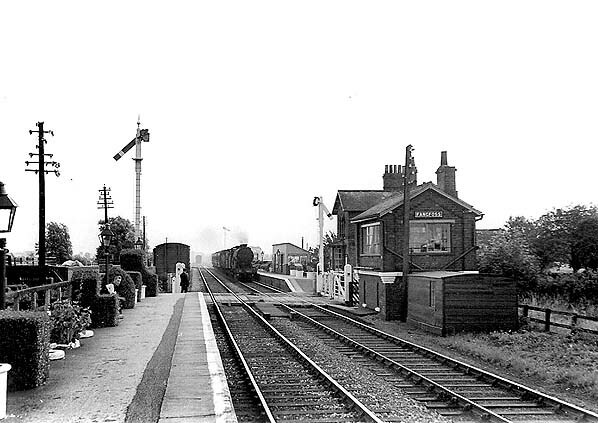 The main station building, which incorporated the stationmaster's house and booking office, was at the south end of the up platform adjacent to the level crossing and was a typical G T Andrews structure. 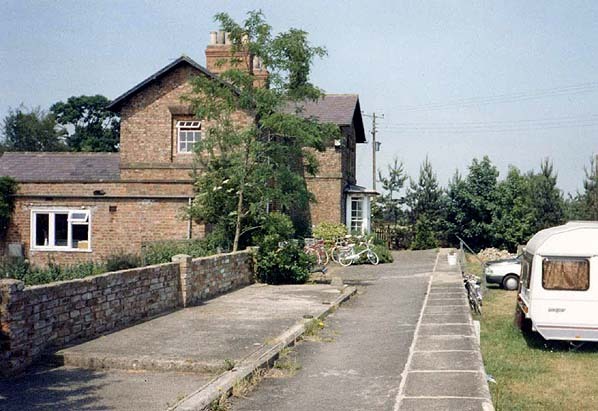 It comprised a two-storey 'T' shaped brick house, with its long side parallel with the platform, and a central gable end facing on to the platform with a ground floor bay window overlooking the platform - a feature of most of GT Andrew's’ stations on this line. Timber waiting shelters, built to the standard NER design, were sited in the centre of both platforms. A signal box was sited at the up side of the line north of the level crossing, opposite the south end of the down platform. This controlled the crossing and access to the goods yard which was opposite the up platform. The goods yard initially (see 1893 map below) comprised two parallel sidings both serving coal drops which trailed into a long siding to form a shunting neck. There was also a general goods siding to the south, running diagonally across the yard and serving a two level loading dock with a weigh office and weighbridge nearby. At some point (see 1910 map below) the long siding became a loop, eliminating a slip across the running lines. The original track layout was later restored. In 1911 the population of the station’s catchment area was 1024. 6,789 tickets were sold that year, and the main freight handled was potatoes with 1783 tons being dispatched. In 1913 110 wagons of livestock were loaded at the station. 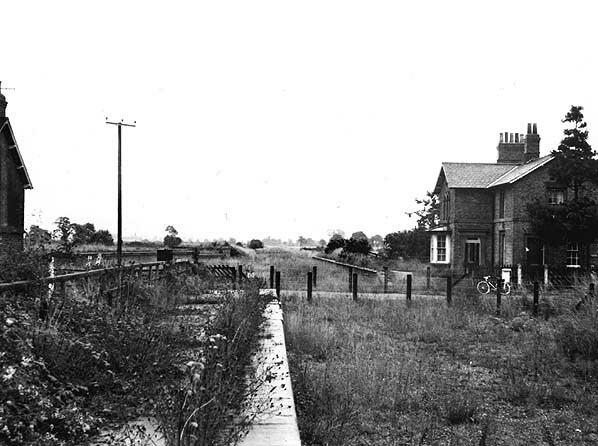 There was a surge in passenger traffic during WW2 in connection with the bomber airfield at Full Sutton one mile north of the station. After WW2 passenger numbers dropped dramatically and, while the line remained open for passenger traffic, the station closed on 5th January 1959, but goods traffic was handled until 7th June 1965. Tickets from Michael Stewart, route map drawn by Alan Young, timetable alterations from Alan Young. Thanks to Sean of Selby (Flickr photostream) for providing transport on 4th May 2020 at short notice. 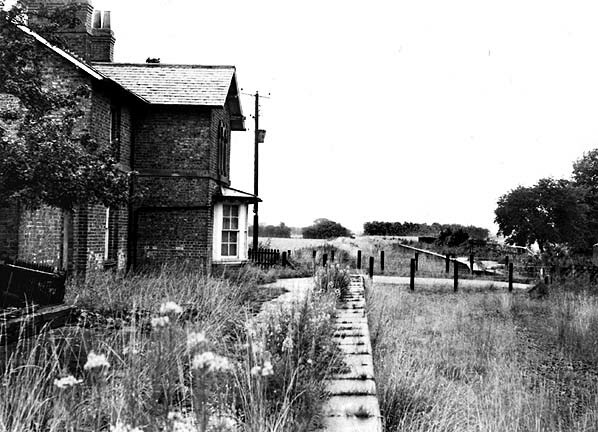 Fangfoss station looking south east c.1950s. Fangfoss station looking north west from the up platform in August 1971. Fangfoss station looking south east from the down platform in August 1971. Fangfoss main station building in April 1976. Fangfoss station looking south east at the up platform in April 1977. Fangfoss station looking north west along the up platform in June 1989. Fangfoss station looking north west along the up platform in May 2010.
is seen on the right.